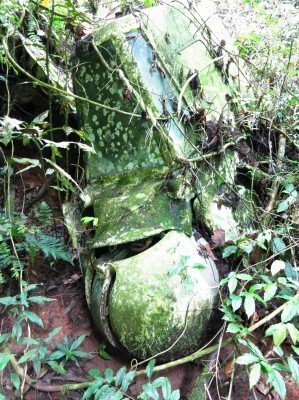 The wreckage of an Antonov 12 cargo plane, missing since September 2007, has probably been found in a central Congolese forest. The wreckage was identified in a joint effort between the TL2 Project in the Democratic Republic of the Congo and the Aviation Safety Network. In November 2012 parts of wreckage of an unknown Antonov 12 were found by a a team of the TL2 Project, a team led Dr. Terese Hart for exploration, conservation and discovery of a part of a central Congolese tropical forest. She published an account of the expedition to the accident site on the project’s website on February 24. Based on photos of parts of the wreckage, the Aviation Safety Network identified the plane as an Antonov 12 due to the characteristic (former) tail gun turret and compartment . Dr. Hart told ASN that a resident of a very small village on the Lomami River remembered a plane flying low over the river in 2007, heading off in the general site of the crash. Low flying planes are extremely rare over this remote part of the forest as the nearest airports are Kisangani to the north and Kindu to the south. The presumed flight route from Kisangani to Goma with the wreckage location(red pin). ASN data shows there have been several An-12 accidents in D.R. Congo. However, all the accidents sites have been located. With the assistance of Dmitriy Yertsov an airplane was traced that was reported missing in September 2007. An Antonov 12BK cargo plane, registered 9Q-CZB, was reported missing on September 29, 2007 after takeoff from Kisangani-Bangoka International Airport (FKI), D.R. Congo. There were five Russian and two Congolese crew members on board. The airplane was leased by the Business and Cargo Company to transport cargo to Goma Airport (GOM), also in D.R. Congo. The airplane never arrived at Goma. Unconfirmed reports later suggested the airplane was seen operating from Khartoum, Sudan. It seems highly likely that the wreckage is that of 9Q-CZB. This airplane had the same tail part, containing a former (closed) gun turret as well as blue colored propeller blades and blue and white paint scheme. 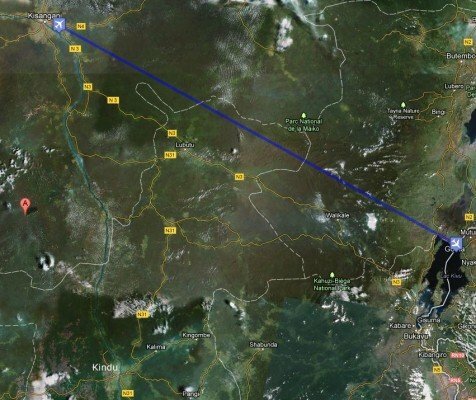 If this is correct, it would indicate that the airplane was either heading towards Kindu, or got lost over the forest as the accident location is off the direct route from Kisangani to Goma. Dr. Hart reported that a ‘yellow sphere’ was discovered. ‘Inside was an odd little box, with a magnetic tape head and two spools wound with ultrafine metal wire.’ This description fits the shape and contents of one of the An-12’s flight recorders. The ‘yellow sphere’ was recovered from the wreckage by the search party. The missing An-12, 9Q-CZB, was delivered to the Soviet Air Force in 1970. In 1985 it was registered CCCP-98103 for the Voronezh Production Factory of the Soviet Ministry of General Machine Building. Following the collapse of the Soviet Union the aircraft was re-registered RA-98103 in Russia and began to operate for KNG Transavia. In 2000 the airplane was registered in Equatorial Guinea as 3C-AAL, still owned by KNG Transavia. Although still operational in Africa, the airplane was considered unairworthy by the manufacturer, Antonov as of 25 May 2005. In July 2007 the aircraft was registered in D.R. Congo as 9Q-CZB. There is no conclusive evidence that the wreckage found in Congo is that of 9Q-CZB. There is however compelling evidence that it is. All parties concerned are willing to cooperate in further investigations. For starters the Russian Interstate Aviation Committee (IAC) has been notified.